In this blog post, I thought I’d go over the basic FAQs that often come up around the fascinating and complex subject of Search Engine Optimisation. If you’re considering engaging SEO services for your website, or giving SEO a try for yourself, these FAQs and answers will give you a great starting point for your research. So, what is SEO and how can it help my website? People search the Internet via search engines such as Google, Yahoo! and Bing – but mainly Google. 🙂 The order in which websites appear in the search engine results page is determined by the relevance and quality of your website in the eyes of the search engine. Search Engine Optimisation is a method of marketing which uses specialised techniques to improve your website’s ranking in the search engine results page for particular keywords. This allows you to capitalise on the traffic delivered to your website through your search engine visibility. Although some may use the terms SEO and SEM interchangeably, SEO is actually a component of Search Engine Marketing (SEM). SEO is concerned with optimising your website to receive higher positioning in major search engines while SEM involves multiple aspects of website promotion through search engines, including SEO and paid search listings. Search engines return two types of search results: organic and paid. Organic search results are the web page listings that the search engine has naturally determined as relevant to the search query. This is where SEO techniques can come into play and help you improve your organic search listing. 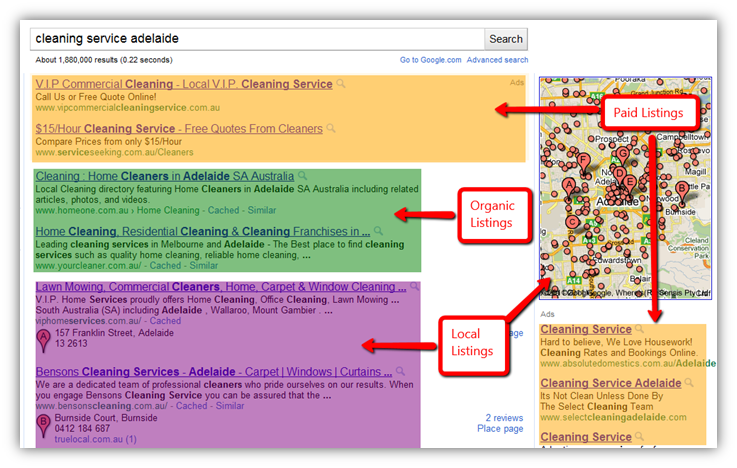 The section highlighted in green below is where organic listings appear in Google. Paid Google listings, also known as AdWords, are sponsored links which appear above and beside the natural search engine results (as indicated by the yellow sections above). Website owners pay the search engine in order for their ad to appear when a relevant search query is entered. Payment occurs on a ‘pay-per-click’ (PPC) basis and you have ongoing control of your ads, keywords, ad link and text. See here for more information on PPC. SEO combines the process of optimising off-page and on-page factors to increase your website’s search visibility. On-page refers to optimisation of the content and HTML of your website pages. Off-page refers to external factors, namely the quantity and quality of links pointing to your website. For more information about on-page and off-page SEO here is a useful link: Updated SEO Fundamentals. What are long-tail and short-tail keywords? Short-tail keywords are short, generic words and phrases; for example, “toys” or “car”. Long-tail keywords are longer, more detailed search queries; for example “buy plush teddy bear” and “rent BMW Australia”. Although the more precise the keyword is the less the search volume, if a potential customer types in a highly specific query in Google which matches your long-tail keyword optimisation, chances are they will find what they are looking for. As such, the conversion rate for long-tail keywords is generally much higher than for short-tail keywords. And how do I track the results? Although SEO affects the movement of your page rank in search engine results, keyword rankings are only part of the measure of success and should not be the primary goal of SEO. A better way to track your SEO results is by measuring incremental increases of non branded organic website traffic. Any questions I haven’t answered here? Please ask them in the comments!